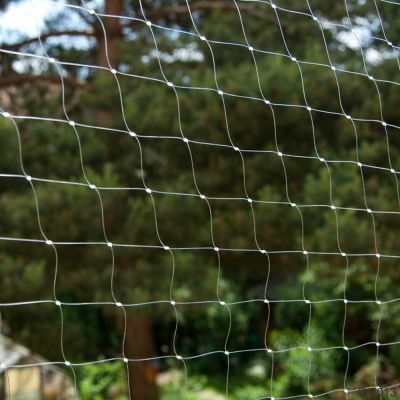 Cat Safety Net - Transparent | Great deals at zooplus! Peace of mind :"We used the neting on the patio and enclosed all sides and roof so the cats can get out in the fresh air but still be safe. 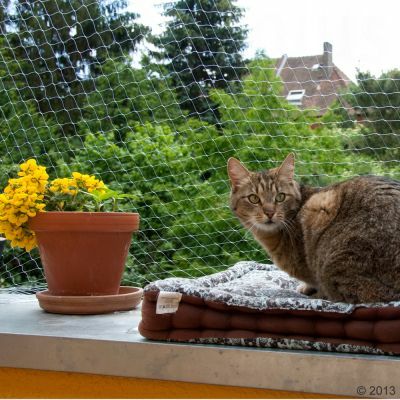 We couldn't imagine how it would work but out youngest uses it like a hammoc"
This transparent cat safety net will protect your cat from tricky manoeuvres on the balcony or near to open windows. It is a great way to make balconies and open windows safe and the transparent material is virtually unnoticeable. 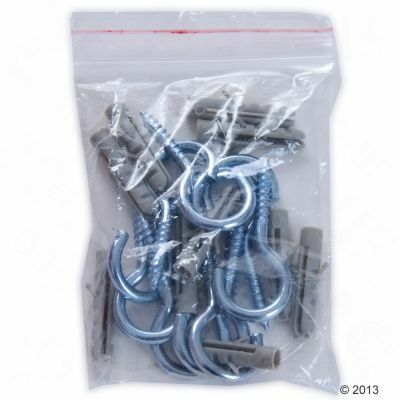 It can be used indoors as well as outdoors and strong and durable, as well as weather resistant and non-toxic. 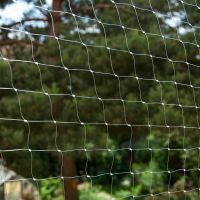 The mesh width is only 3 x 3 cm so it is suitable for kittens and small cats. Fixtures and fittings are included and assembly is fast and easy. The safety net can be cut to shape with scissors. 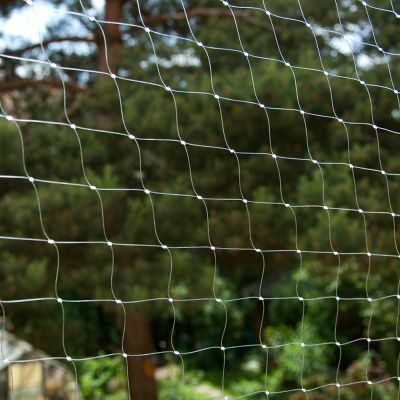 The cat safety net is tested to ensure that it's UV and weather resistant and that it is non-toxic. Note: Stretch the net to the size you need by opening it out all four corners. 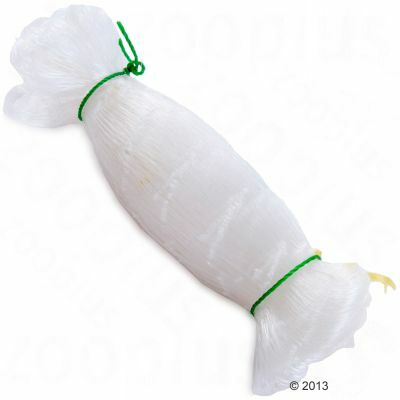 The different areas are marked with bright pieces of string. Very important: Do not leave your cat unattended with the net. 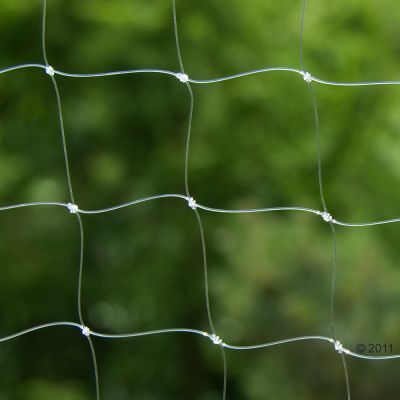 We have been using these nets for years. They let all the light through, don't cast much of a shaddow, so we can still enjoy our garden to the fullest. For one person maybe a bit of a hassle to put up, for two people no problem at all. We suggest replacement after about 18 months, then they do start ripping: check regularly, if still safe. This is a very functional and convenient way of keeping your pets safe from kamakaze moves off the balcony. Quite easy to negotiate even though when you open it you feel like you're going to drown in netting, but follow the instructions and all will go well. Hitch it up in whatever large room you have in your home first before threading the cord otherwise you'll get frustrated. I hooked the corners over anything I could find and then set to work. Built onto veranda used wood struts and metal poles to lean to make roof. Put escape cat in found anything we missed and they have Ben safe all year. We check regular and only two holes when escape cat had little teeth big cat never damaged it. Would recommend it to all who want cats to have fresh air we have cat flap onto veranda but cats stay safe. We used the neting on the patio and enclosed all sides and roof so the cats can get out in the fresh air but still be safe. We couldn't imagine how it would work but out youngest uses it like a hammock above the gate we made, he found gaps we missed but just cable tied them and has been up through all weather for about six months now and is doing the job we wanted it to. As the cats get older they have stopped chewing, we used wood to attach it to the decking and soft metal struts to get roof. My Cat managed to chew threw this net. My cat chews everything but I thought this being a "cat" safety net that it might hold up, but alas it did not. I have 4 elderly indoor cats. Due to arthritis, diabetes, teethlessness, slow reaction times; they have had to give up their outdoor world for the past year. This cat net is east to install, not very strong but so far none have tried chewing or climbing up it. I supervise their outdoor time anyway. It's not 'invisible'but it's not as ugly as pigeon nets so none of my neighbours have made any complains. I'll upload photos. Mine is the patio with the purple petunias. I received this net for my balcony and it arrived slightly damaged so it's fair to say it's not very strong however it does the job. 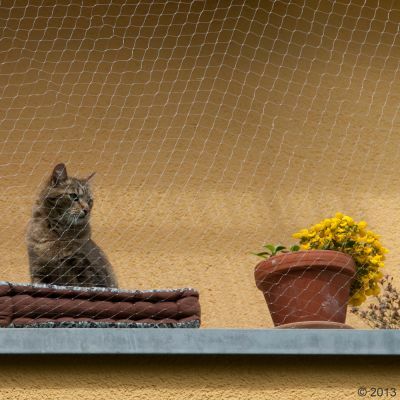 My 2 cats enjoy the use of their small balcony and it seems they are not even tempted to chew the net. The net is visible from the street so not quite invisible but it's not too big of an eye sore. It's definitely helped and my cat are very happy on the balcony. I have 4 indoor cats and a small 5m x 1.5m terrace area to the rear of my ground floor property. I have the net sloping diagonally from high above the door to meet the wall which is approx 5ft. The cats love being able to go outside and sniff he fresh air, bathe in the sun and stalk insects etc. Only downside is that my terrace is now essentially a giant cat run which gets strange looks from visitors and neighbours, but what can I say, they're worth it. I bought this with the intention to cover an opening with a Sash Window. I adjusted the fixing method to suit a rented flat, and window as most of the images of this product, showed up with balconies etc. Basically used two voile/curtain poles (screw, not spring loaded) weaved in and out the top and bottom of the required size of net. tightly screwed those in place so they don't move, and then used small hooks to hook out the edges to stop any escaping that way. Wonder perfectly well. See the pictures for more details.